SECTOR: FAIL ABN AMRO is in the Financial sector, which is one sector that this methodology avoids. Technology and financial stocks were considered too risky to invest in when this methodology was published even decades ago. Several of Graham's criteria, like the Current Ratio and Debt to Current Assets, do not apply to financial companies. As a result, the company will not be able to pass this methodology, although we will include the remainder of the analysis for informational purposes. SALES: PASS The investor must select companies of "adequate size". This includes companies with annual sales greater than 260 million Euros. ABN AMRO's Operating Income of 9 billion, based on 2017 figures, passes this test. CURRENT RATIO: FAIL The current ratio must be greater than or equal to 2. Companies that meet this criterion are typically financially secure and defensive. ABN AMRO is a financial stock so the current ratio analysis cannot be applied and this criterion cannot be evaluated. LONG-TERM DEBT IN RELATION TO NET CURRENT ASSETS: FAIL Long term debt must not exceed net current assets. Companies that meet this criterion display one of the attributes of a financially secure organization. ABN AMRO is a financial stock so this variable is not applicable and this criterion cannot be evaluated. LONG-TERM EPS GROWTH: PASS Companies must increase their EPS by at least 30% over a ten-year period and EPS must not have been negative for any year within the last 5 years. 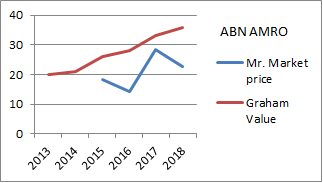 EPS for ABN AMRO have been increasing. In the past, ABN Amro (and many other banks) failed. Earnings Yield: PASS The Earnings/Price (E/P) ratio, based on the lesser of the current E/P or the E/P using average earnings over the last 3 fiscal years, must be "acceptable", which this methodology states is greater than 6,6%. Stocks with high Earnings Yields are more defensive by nature. ABN AMRO's Earnings Yield of 11% passes this test. GRAHAM NUMBER: PASS The geometric average of 1,5 x book value and 15 x EPS is the Square Root of 1,5 x 22,8 Euros x 15 x 2,5 Euros = 35,7 Euros. DIVIDEND: ABN AMRO pays a dividend of 50% of earnings, was 1,45/24,3 = 6%. AJB. Simple theme. Theme images by luoman. Powered by Blogger.